Arrival at Ilhéus airport, former cocoa capital, where we will do a city tour and be greeted with a delicious welcome lunch to the region. 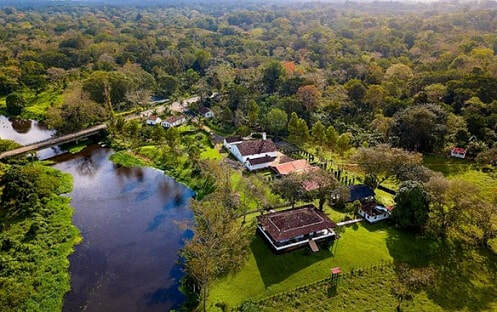 We then continue to the beautiful fazenda where we will stay, and before dinner, our author and guide will make a presentation of the itinerary and explanation of the activities that we’ll be doing the next 11 days. Accommodation. We will leave the fazenda by bicycle. Riding along 16km of trails, mostly plain, of Atlantic Forest and cocoa plantations, we will arrive at an old town called Estação Rio do Braço, which was the epicenter of the cocoa period. Here, our guide and author Juliano will tell us about the history of the place with details that introduce us to the interesting history of the region. Then we will have lunch. In the afternoon we will have a walk through the Trilha da Cabruca to learn even more about the history of cocoa. We finish our activities of the day in the best way: with a participative workshop of cocoa and chocolate where we will witness the process and manufacture, as well as taste the final product. We have dinner at our fazenda. Accommodation. After breakfast, we will check out and leave the farm by bike to ride for 5km through the green nature to reach the Almada River (our bags will go by car to the next destination). Here we’ll continue enjoying the scenery, but aboard a boat that takes us along the river for 50 minutes until we find the dazzling Lagoa Encantada. Upon arrival, we will make a walk around the lagoon to then return to our bicycles and take a 20km ride along the beach to Serra Grande. We will have the free afternoon to rest in the natural comfort of the pousada or get to know the charms of this small town that attracts more and more families and visitors from all over thanks to its extensive beaches and an interesting environmental, cultural and educational movement. We will have dinner at the pousada. Accommodation. In the morning, we check out and go walking along the beach 1km until the beginning of the trekking that takes us to Prainha (small beach). Then we continue to Mirante II, from where we will have a spectacular view of some of the 30km of beach that goes to Ilhéus. After being delighted by the view and taking pictures, we will ride our bicycles for 5km, crossing the village of Serra Grande with its cobblestone streets, until we arrive at the Fazenda Juerana. A delicious lunch will be served here, with products from the region and in the afternoon, we will have the opportunity to walk through the native forest and cocoa plantations until we reach a beautiful waterfall to take a bath. At night, we’ll go have dinner in Serra Grande where we’ll taste different varieties of the traditional tapioca made of manioc. Accommodation. After enjoying a good natural and healthy breakfast, we will go kayaking to the mouth of the Tijuípe River. It will be a journey of adventure and contemplation of the flora and fauna from a privileged place, navigating in our own kayak on the river. We will arrive at Praia da Barra, where we will have lunch and enjoy a sea bath. The return will be done walking on a path amongst the jungle and then in a car that will take us to our fazenda. We’ll have the afternoon free and then we have dinner in Serra Grande to integrate a bit with its movement and understand why this small village is so attractive and welcoming for people who come to visit. Accommodation. This will be a day full of adventures and interesting encounters, pedaling along 22km on dirt road with ups and downs accumulating a total of 700m of altitude. We start by cycling in the morning to the Floresta Viva Institute, where we will learn about the environmental preservation activities and objectives of this project located in the middle of the native forest. We continue by bike to the town of Aguas Claras to take a refreshing waterfall bath and then continue to our destination in the PESC, Serra de Conduru State Park. Here we will walk while we listen and learn about this natural park; when we return, we rest and have lunch to recover our energies. In the afternoon we will continue our ride to the town of Barrocão, where we will be welcomed by the women of the Association Doces Encantos da Floresta. They will present the association, explain how this project came about, and tell us about life in the field today. ​Before dinner we will have the opportunity to participate in the production of one of the delights produced by these women: we will make a sweet or a conserve, depending on the fruits and ingredients available this day. Dinner and accommodation in family homes. After breakfast we say goodbye to the families who welcomed us, and we continue our adventure towards the town of Taboquinhas. We’ll pedal for 30km of road, going 600m up and the 465m down, (we will have a support car), until reaching the Fazenda Vila Rosa, which will accommodate us. We will have lunch and free afternoon to rest or enjoy optional activities, such as rafting, hiking or kayaking. Dinner and accommodation. We have breakfast and leave by car towards Itacaré. Once here, we’ll cross the Rio das Contas on a boat with our bicycles and then start pedaling for 27km along the Pontal de Itacaré beach to the spectacular Lagoa do Cassange, on the Maraú Peninsula. After lunch, we can enjoy the afternoon at our whim in the beautiful pousada that invites us to integrate with the life and calm of this coastal paradise. Accommodation. We check out and take the last bike ride of our trip, riding for 12km along the beach of Lagoa do Cassange to Taipú de Fora. This beach reveals itself with beautiful natural pools where we can swim freely, enjoying the landscape. We’ll stay long enough to also enjoy a delicious lunch and after saying goodbye to our bicycles we go in a 4WD to Barra Grande, another coastal town on the peninsula. From here we board on a boat to take a tour around the islands of Camamu Bay. We’ll visit four of them and later we’ll arrive at the Carapitangui River, to contemplate the sunset and to take a pleasant sea or river bath. Accommodation. Breakfast and check out, to continue by boat to Camamu, where we will visit the community of Jatimane. Here we will visit a Quilombola community, with its history, customs and ways of life. After lunch, we continue the trip by car to Salvador, capital city of Bahia and our last stop. At night, we go to the Miguel Santana Theater to see the presentation of the Balé Folclórico Company of Bahia. In the intimacy of the theater in the Pelourinho, we will witness a perfect representation of the many African traditions that shape Bahian culture: the sacred dances of candomblé; "Puxada de rede", a fishermen song in honor of Yemanjá, the goddess of the sea; maculelé, an acrobatic dance of stick and sword; capoeira, a martial art/dance of Angolan origin and the samba de roda, a version of this exuberant national dance. Accommodation. We will make the most of our last day of activities, with a tour of Salvador. We’ll visit the historic downtown, called Pelourinho, where we find the largest architectural ensemble in Latin America and it is the meeting point of all the locals. We will also visit the Cidade Baixa (Lower Town) through the São Joaquim and Barra market. At night we will have a delicious farewell dinner, where we will remember the best moments, the most challenging and we’ll celebrate this wonderful adventure by bike along the Cocoa Coast. Accommodation. After breakfast, transfer to Salvador airport. Farewell and end of the trip. Led by Juliano Borgui. Juliano, 36, is Geographer and Environmental Manager, specialized in sustainability management and Msc. in Sustainable Development. Passionate about outdoor sports, he loves to travel and to know new territories, cultures and landscapes by bicycle. He has traveled by bicycle through several countries in South America, Mexico and France. He recently completed his Master Degree's research on strategies for the promotion of cyclotourism in the Cacao Coast, Southern Bahia Region. He has dedicated the last 10 years to socio-environmental projects, working in non-governmental organizations and research centers in renowned Brazilian institutions. Currently, he seeks to unite his passion for cycling and professional experience in the socio-environmental area, hosting groups that seek unforgettable experiences in the region of the Cacao Coast. He speaks Portuguese (native language), Spanish and English. 4) Since SGL rooms are limited, there is the possibility of sharing room. SGL rooms will only be confirmed on the deadline depending on availability. 8) Operator makes it compulsory that all participants be covered by appropriate travel insurance. This insurance should include the following minimum requirements: emergency medical expenses and assistance service, medical repatriation and transportation, as well as burial, cremation or return of medical remains. Operator recommends extending the insurance to include additional benefits such as cancellation or curtailment, personal accident insurance, lost luggage, delays, etc. o Led by Specialist Juliano Borgui from day 1 to 12 in this trip. o Closed, waterproof and comfortable footwear to take walks in nature, because of insects and wet sections. o Insect repellent, flashlight, raincoat, swimwear and sunscreen all year. • Banks and money exchange: The exchange and/or cash withdrawal at ATMs is preferably done at airports for security and because most experiences take place in locations with little banking structure.